Cryptocurrencies are one of the more exciting tech ideas to spring up in recent years. The promise of these payment methods – that they can represent a secure yet convenient alternative to standard currencies – shows their great potential. Currencies such as bitcoin have begun to make the transition from intriguing concept to practical part of everyday life, with an increasing selection of companies across all industries accepting bitcoin payments in place of cash or credit. In fact, CNBC noted in 2018 that businesses such as restaurants, online stores and even apartment rental platforms have taken to using cryptocurrencies. What does this mean for your next road trip? If you book your rental with the right provider, you can pay in bitcoin, ensuring a fast and secure transaction, free of extra fees, complications or the need to carry too much cash. Stepping into the future with a bitcoin car rental is an exciting way to add cryptocurrency to more aspects of your life, while making an everyday transaction easy and secure. 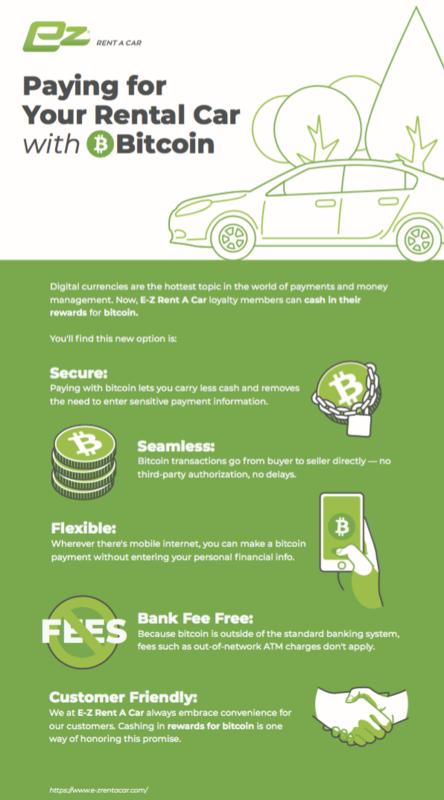 If your normal way of paying for a car rental involves using cash, you may benefit from switching to crypto right away. While cash is the simplest way to pay for everyday things, it’s not necessarily the safest or most convenient. When you choose to use cash, you’re carrying large sums of money in your pocket – which can be nerve-wracking during travel. Losing your wallet becomes an especially serious problem when it’s stocked with bills. Furthermore, if you want to purchase extra coverage or find out you have the wrong amount of money on you, you’ll have to head to an ATM and potentially pay a fee if the machine isn’t in your bank’s network. Traveling around the world should be fun, right? Enjoying your vacation is much harder when you’re wondering where your cash is at all times. Bitcoin car rentals are a great solution to this dilemma. Leave the cash for a car rental home, and instead pay using a cryptocurrency app. Mobile payments via bitcoin are accomplished immediately and securely, transferring the funds from peer to peer. Bitcoin isn’t just a replacement for cash, it’s also superior in some ways to using debit or credit through the web. The advantage comes from improved security: You don’t have to enter personally identifiable information to secure a bitcoin car rental. Inputting your data, especially when your mobile device is connected to a public Wi-Fi network, is a potential data security risk. Bitcoin and the blockchain technology that power it have been designed for safe and anonymous transactions, carried out without the data entry steps that characterize traditional digital shopping. The peer-to-peer nature of bitcoin payments, in contrast to credit or debit card use, helps ensure transactions go through smoothly. When you’re far away from home, stepping off a flight in a new city and ready to pick up your rental car, a bank may detect a credit transaction in a new location and freeze your account. This could put your plans on hold while you make an inconvenient call to convince the credit provider you’re really you. A quick, peer-to-peer bitcoin transfer just goes through instantly. The payment is made and you’re ready to drive. Tech innovations are at their best when they give people more options and allow them to feel safer and less concerned. This is why bitcoin car rentals are a revolutionary idea. There is a convenience and customer friendliness to paying this way that legacy payment methods can’t offer. Over a long trip, the advantages add up. Leaving home with less cash is a plus. Not having to enter personal information over unknown Wi-Fi networks is another. Ensuring payments go through instantly and without added-on fees is yet another. No matter how far you go on your vacation, whether you’re venturing to a new country for the first time or using a rental car to get acquainted with the back roads and byways of your own home state, peace of mind is the best traveling companion you could ask for. Wondering about incurring ATM or credit card fees isn’t fun. Being concerned that someone could have stolen your personal information on unsecured Wi-Fi is stressful. Getting turned down for a transaction because your account has been frozen is definitely worrisome. You can put the fun back in travel with bitcoin. If you’ve already ventured into the world of cryptocurrency, you may have experienced the exciting convenience of using this new payment method to make everyday purchases differently. Companies that offer this new way to pay are looking out for you, letting you make practical use of your cryptocurrency. This support among businesses is what will let bitcoin take off and become a convenient part of everyday life. At E-Z Rent-A-Car, we stick to practices and policies that will be convenient for our customers. Our use of bitcoin follows this philosophy.